Background: Acute appendicitis is one of the most common indications for emergency surgery. In patients with a complex appendicitis, prolonged antibiotic prophylaxis is recommended after appendectomy. There is no consensus regarding the optimum duration of antibiotics. Guidelines propose 3 to 7 days of treatment, but shorter courses may be as effective in the prevention of infectious complications. At the same time, the global issue of increasing antimicrobial resistance urges for optimization of antibiotic strategies. The aim of this study is to determine whether a short course (48 h) of postoperative antibiotics is non-inferior to current standard practice of 5 days. Methods: Patients of 8 years and older undergoing appendectomy for acute complex appendicitis - defined as a gangrenous and/or perforated appendicitis or appendicitis in presence of an abscess - are eligible for inclusion. Immunocompromised or pregnant patients are excluded, as well as patients with a contraindication to the study antibiotics. In total, 1066 patients will be randomly allocated in a 1:1 ratio to the experimental treatment arm (48 h of postoperative intravenously administered (IV) antibiotics) or the control arm (5 days of postoperative IV antibiotics). After discharge from the hospital, patients participate in a productivity-cost-questionnaire at 4 weeks and a standardized telephone follow-up at 90 days after appendectomy. The primary outcome is a composite endpoint of infectious complications, including intra-abdominal abscess (IAA) and surgical site infection (SSI), and mortality within 90 days after appendectomy. Secondary outcomes include IAA, SSI, restart of antibiotics, length of hospital stay (LOS), reoperation, percutaneous drainage, readmission rate, and cost-effectiveness. The non-inferiority margin for the difference in the primary endpoint rate is set at 7.5% (one-sided test at α 0.025). Both per-protocol and intention-to-treat analyses will be performed. 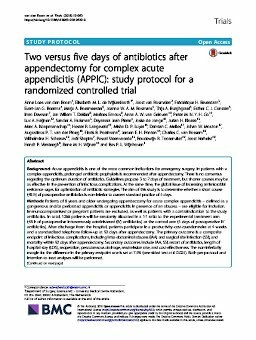 Discussion: This trial will provide evidence on whether 48 h of postoperative antibiotics is non-inferior to a standard course of 5 days of antibiotics. If non-inferiority is established, longer intravenous administration following appendectomy for complex appendicitis can be abandoned, and guidelines need to be adjusted accordingly.